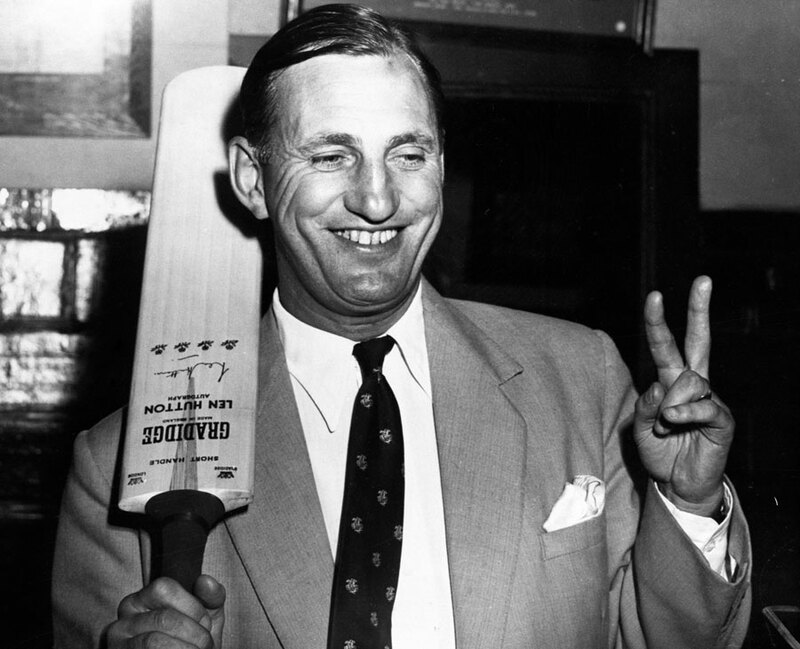 Under Len Hutton, England had won the 1954-55 Ashes 3-1, bouncing back after losing the first Test in Brisbane. Though their batsmen were inconsistent throughout the series, Frank Tyson and Brian Statham had destroyed the formidable Australian line-up with pace and cunning. New Zealand seemed ill-prepared against such a dominant opponent. They had been thumped 4-0 in South Africa the previous season and lost the first Test against England in Dunedin despite two days being lost to rain. They were comfortably placed at 67 for 1 at lunch on day five, but once Bert Sutcliffe was run out, they folded for 132 and England charged to an eight-wicket win. 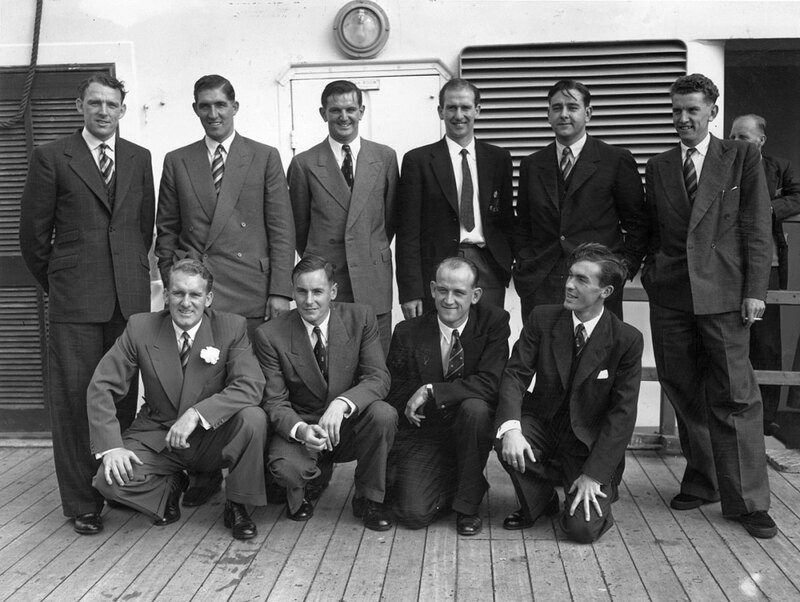 Frank Tyson: When we reached New Zealand we knew that if we could maintain the psychological impetus from the Ashes victory, we could really dominate. 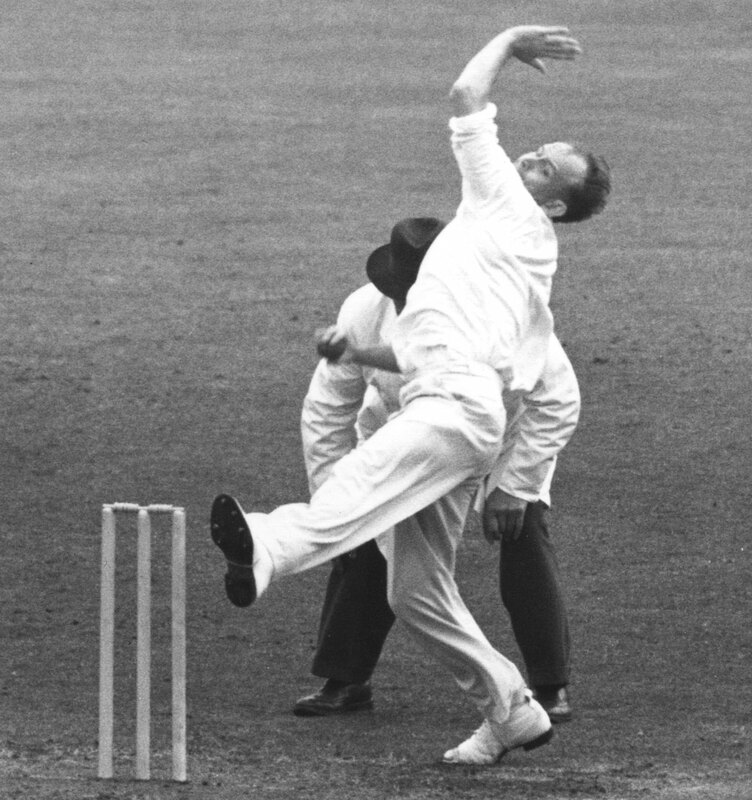 Harry [Hutton] often said that he wanted to take home an impression that we were a very, very good fast bowling side. We had a fast bowling and psychological supremacy we never had before. We were coming to New Zealand on the crest of a wave, having done so well in Australia, and we were feeling as if we were omnipotent. We had seized the initiative and anything below top-standard batting would demand a great deal of application from New Zealand. John Reid (in Sword of Willow): It was a good England side. Against that, we went into the two-Test series in late March not having had any first-class cricket for several weeks. We had a trial match in February and for most of us, that was it. Len Hutton (in Fifty Years in Cricket): New Zealand had slumped from the vintage year of 1949 when they held England to four draws in three-day Tests. Now given five days, New Zealand lost at Dunedin and Auckland inside three days. Bob Appleyard: Having beaten Australia, we were in a good position to beat New Zealand. We had very good spirit. They were not a particularly strong team, except for Sutcliffe and Reid. In the second Test, in Auckland, New Zealand elected to bat and were 76 for 3 at lunch after losing Sutcliffe at the end of the session. Reid and his captain Geoff Rabone put on 78 but they couldn't score quickly enough. England's bowlers soon took control and New Zealand finished the day on 199 for 8. Bert Sutcliffe (in Between Overs - The Memoirs of a Cricketing Kiwi): I felt in fine form at that time, but just before lunch I lost my concentration and got out for 49. Tyson: The Eden Park pitch helped seam bowlers. New Zealand were fairly inexperienced. Sutcliffe had batted against all odds, leading New Zealand's batting in South Africa the previous year. Reid was coming of age and both were world-class players. We knew that if we could account for them, then most of the work was done. Reid: I was pretty happy with my 73. Tyson and Statham were still a handful, and so was Bob Appleyard, who took three wickets with his very brisk offcutters, but we definitely looked more solid. Tyson was the really intimidating bowler. He just steamed in and let it go at you at frightening pace. We'd never been subjected to that sort of pace. Hutton had picked up an infection a week before the Test and dropped down the order. So Reg Simpson walked out with Tom Graveney. The two began tentatively but Graveney sustained an injury while fending off Reid and was soon out to a short ball from Johnny Hayes, caught by Rabone at third slip. Simpson charged legspinner Alex Moir just before lunch and patted back a simple return catch. Peter May, at No. 3, took on the bowling but he couldn't beat a soggy outfield; his 48 contained seven threes. But just as May and Colin Cowdrey appeared to be building a partnership, both fell with the score on 112. There was more rain, and England ended the day on 148 for 4, still 52 behind. Sutcliffe: This looked much too modest a score to contain England's batting, but New Zealand in the field was a much more forthright team than New Zealand batting. On the third day, Godfrey Evans and Johnny Wardle bagged ducks, both caught by Reid off Moir at first slip. England were still 36 behind when Tyson walked in to join his captain, Hutton. "Stick around for a while, Frank," he was told. "We may not have to bat again." Tyson: It was an interesting sort of comment. I respected Len as the best bad-wicket player in the world at the time. I appreciated his ability to judge the wicket, and the chances of survival or non-survival in those particular circumstances. The way he assessed the situation, and to say to your No. 8 batsman to stick around was incredible. In my second Test in Brisbane, I finished 37 not out. I was regarded as someone who could contribute a little to our batting lower down. We struggled to get to 200 on that [Eden Park] wicket, which was helping seamers a little. Another 20-odd, he felt, would make the difference. New Zealand took the new ball soon after lunch and Tony MacGibbon broke through Hutton's defence. His 53, in 143 minutes, was England's highest score - made more significant by the fact that it was to be his final Test innings. When Hutton fell, England led by just one run. Appleyard did not last long. But a 28-run last-wicket stand between Tyson and Statham gave England a lead of 46. Was that enough? At three o'clock sharp, New Zealand started their second innings. In 40 minutes, they lost Gordon Leggat, Matt Poore and Reid, and went to tea at 13 for 3. Immediately after the break, Hutton brought on Wardle, who picked up the most important wicket. Hutton: The key dismissal was Bert Sutcliffe, who made 11. I introduced Wardle to bowl chinaman. Sutcliffe went for a big hit and was bowled. Curiously, Hutton then replaced Tyson with Appleyard. Tyson had taken 2 for 10 off his seven overs, but Hutton had sensed something that Tyson hadn't. Tyson: I had taken 28 wickets in Australia and saw my opportunity to add to that in New Zealand. When Hutton took me off I was not impressed at first. Hutton was full of these quirks. He himself bowled the last over of the Sydney Test and got Richie Benaud out bowled with a legbreak, which brought an end to the tour. Appleyard turned the match in just a few balls. Harry Cave was caught by Graveney; MacGibbon was lbw second ball; and the wicketkeeper Ian Colquhoun, as in the first innings, lasted only one ball, caught splendidly by Graveney. Wicket, dot, wicket, wicket: Appleyard was on a hat-trick for the second time in the match. Moir walked in and offered a tentative prod to a well-pitched offbreak, which fell tantalisingly short of Graveney. But strangely, Appleyard was taken out of the attack with New Zealand 22 for 8. Appleyard: Len was asked by the press afterwards why he took me off. I might have taken five or six wickets. And he said he wanted to end the tour as we'd started, with Tyson and Statham bowling. Len used his quicks as strike bowlers. And if they weren't getting wickets early, he would put one of Johnny [Wardle] or myself on. And then if we got a wicket, he would take us off and the quicks would be back. Those were his tactics. It did frustrate me at times. But we had tremendous faith in Len. He was such an experienced captain who used his resources very well. Tyson: I had never seen anybody bowl like Appleyard on that afternoon on the second day. He was a dual-capacity bowler who could bowl swing and offspin. He was a big chap but he spun and cut the ball a long way. He got wickets and kept it tight. He could swing the ball when it was new and then bowl fast offcutters when it was old. Hutton: The fact was, any combination of bowlers was strong enough, and I felt Tyson and Statham had earned the right to be in at the kill. One over from Brian, however, was enough. Statham removed the last two New Zealand batsmen, including cartwheeling last man Hayes' middle stump. Sutcliffe: I still cannot fully explain how we were out for 26. Bad batting, of course. Good bowling, undoubtedly. Lack of resolution, almost certainly. And perhaps the intensity of the struggle earlier had taken something out of our rather inexperienced and diffident batsmen. It really was an extraordinary affair. It seemed hardly fair that we should have been so humiliated after putting up so stout-hearted a performance for two and half days. Hutton: Usually a batting calamity is brought about by one bowler or a pair. At Auckland I used four to bowl 27 overs, and it has been said that had I kept Tyson and Statham on, the total would have been even smaller. Tyson: It was obviously an indication of the England side at the peak of its performance. They had set a seal and a stamp on the actual standards they had established for the remainder of 1950s. A large crowd had come to witness the third day's play. Everyone had expected New Zealand to cash in on the small but important lead they had conceded. A friend of Sutcliffe's planned to fly over from Christchurch once he heard of England's struggles. Sutcliffe: At that time the New Zealand internal service was operated with DC3s, fine aircraft, but not swift by recent standards. This traveller, a very keen cricketer, started his flight about the time we started our innings. The pilot was good enough to pass back messages to him, giving him the score at frequent intervals. Long before he had covered the 500-odd miles to Auckland, the game was over.